What is eGov AppStore ? How to search for an application? How to view application details? What is a downloadable application? How to use a downloadable application? What is a runnable application? How to use a runnable application? Will my comments be read? What if I am having difficulty downloading an application/product? How does eGov Apps Portal maintain accessibility? Where can I get the brochure? What are the terms of upload? 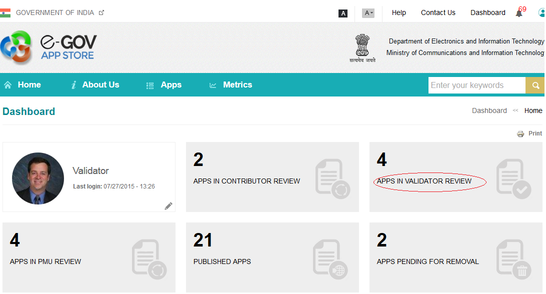 What is the process of publishing an application in eGov AppStore? 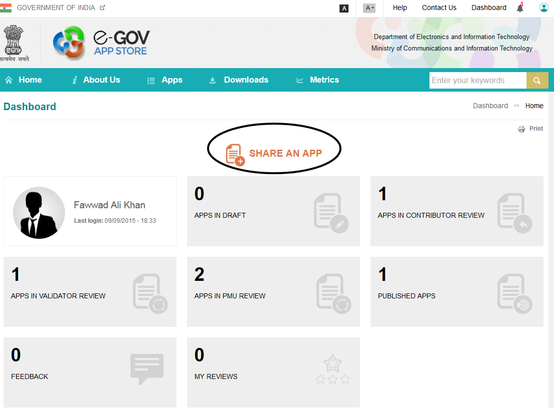 How to contribute an application in eGov AppStore? 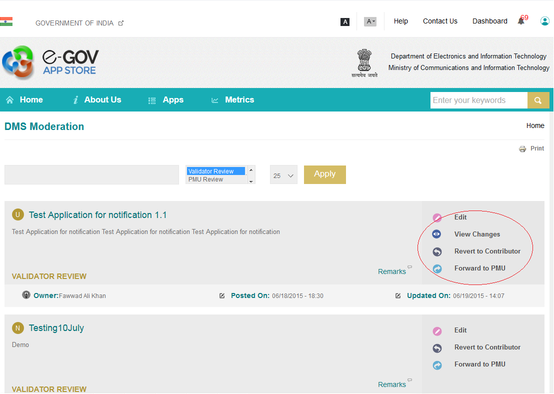 How to validate/approve an application in eGov AppStore? With the vision of accelerating delivery of e-services as envisaged under NeGP and optimizing ICT spending of the government, the Government of India has launched the initiative of establishing the e-Gov AppStore. 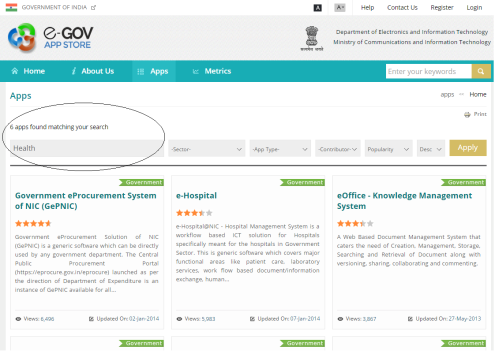 The e-Gov AppStore is a national level common repository of customizable and configurable applications, components and web services that can be re-used by various government agencies/departments at Centre and States, which will include the setting up of a common platform to host and run applications (developed by government agencies or private players) at National Clouds. e-Gov AppStore has features which allows private agencies including SMEs to provide details of their good applications which may be adopted by states/departments after due trials. Application developers for the public sector will be able to promote successful applications for replications across interested states/departments. Additionally, it provides opportunity to private players to showcase products relevant to public sector in delivering citizen centric services. Interested users may provide feedback on the products developed by the private sector for enhancement /additional features for adoption by willing states/departments. Further, public and private sector agencies may share concepts, ideas and requirements on applications which would aide public service delivery. Core and common applications that have high demand and are replicable across the central and state levels are likely to be included in e-Gov AppStore, which shall be hosted on the National Cloud. Common components like the payment gateway, messaging platform, MIS reporting, etc, will also be made available in the e-Gov AppStore. Any department can use the services of e-Gov AppStore through two primary means – either by directly running an application available in the respective e-Gov AppStore or by downloading an application from the respective e-Gov AppStore. 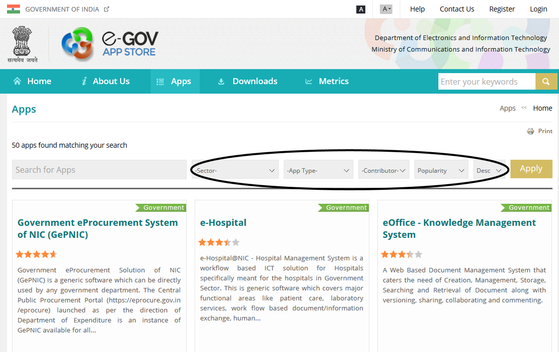 Presently, the e-Gov AppStore is primarily a repository showcasing NIC applications and components which were developed for specific requirement of States. These applications are not yet in their productized form. Going ahead, some of the popular applications will be productized and made available on the e-Gov AppStore to be used as SaaS. Allows authenticated (privileged) users to download application for consumption. An authenticated user is one who is registered with AppStore portal and have a user ID and password to login. The e-Gov AppStore will be implemented in a phased manner over a period of time. In due course, a complete eco-system will be established (including mechanism for funding, charge back, contract management, SLAs) and will become a part of the GI Cloud initiative under Government of India. Click on the APPS tab in the menu bar on Home page. Portal will list all the published applications in the eGov AppStore. The panel above provides link to sort and filter the applications. The extreme left hand side box shows “Search for Apps” box. By default, there will be no filter applied and all the published applications will be shown in the order of ‘Most Viewed’ first and so on. 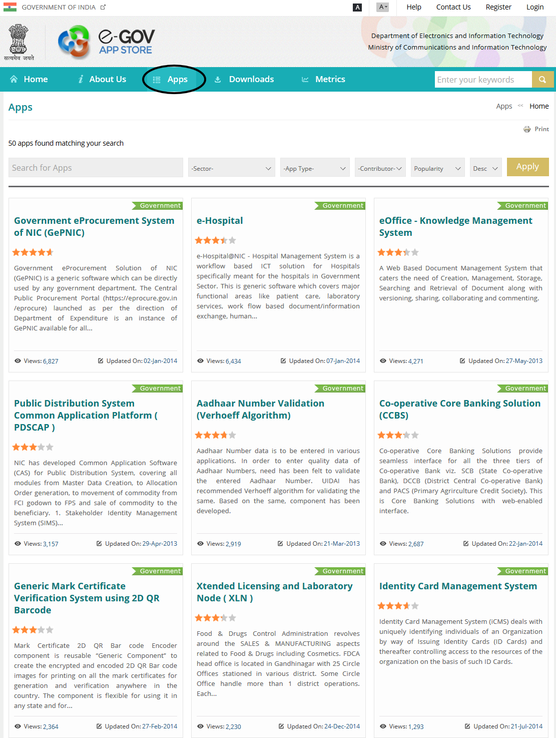 Published applications can be sorted based on different criterion like Sector, order (Ascending and Descending), Title, Popularity, Rating, Last Updated, Most Recent, Web based, Mobile App, Component, Web-service, Government and Private by putting appropriate filter in the panel above. An application can be searched based on a key word. Search can also be performed on the basis of sectors, application type, Government, Private etc. An application detail can be viewed by clicking on the application name. Downloadable applications are those which can be downloaded from the AppStore. These applications can be installed and used with some level of customization. User may contact the contributor of the application through “Contact Forms”. Queries may be sent to the contributor for any requirements for configuration, customizations and master data preparation through Contact form. Authenticated user may refer to the “Download Section” for downloading the user manual and technical manual. User may look at the demo URL for test run of the application. Authenticated user can download the application code and database. He can then deploy the downloaded application and database in his own environment. All the underlying software (operating system, database management system, web server, application server etc.) and hardware are to be provisioned by the user only. User may contact the contributor for any issues in deployment/using of the application. It may be noted that the application in its current form may need some level of customization/master data preparation before it can be used with respect to your requirement. Runnable applications are those which are made available from the central servers on cloud or otherwise by the application provider. These applications can be used with some level of customization. Authenticated user may refer to the download section for downloading the user manual and technical manual. User can request the contributor for creating the application instance. Once administrative formalities are completed, an instance will be created for testing/use. User may contact the contributor for any issues in using the application. 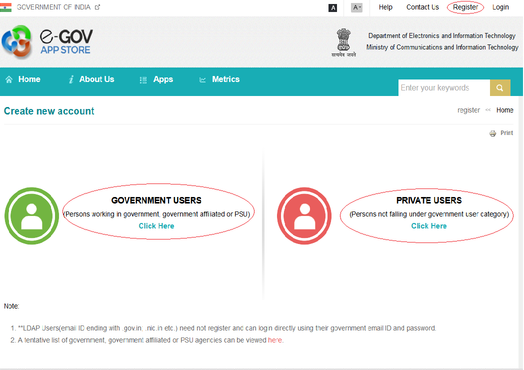 Emails sent through ‘Contact Us’ or ‘Feedback’ page of eGov Apps Portal will be sent to the relevant person for review. Comments/Feedback related to the eGov Apps Portal itself will be taken up by the Program Management Unit (PMU) for necessary action. Some web browser configurations, particularly those that are designed for high security computing environments, can interfere with access to certain applications/products. This is most commonly related to government websites that use security certificates, and end user browsers that are not configured to recognize those certificates as being authoritative. If you are having difficulty downloading one or more applications/products from the e-Gov AppStore Portal, please contact us to determine whether browser configuration issues can be addressed for your workstation. Alternatively, you may also send your comments using various options such as ‘Contact Us’ and ‘Feedback’. If you have any problem or suggestion regarding the accessibility of this website, please use the 'Feedback' or 'Contact Us' page to enable us to respond in a helpful manner. Skip to Navigation: Quick access to the Navigation pane is provided that enables accessing the Apps. Accessibility Options: Options to change the size of the text and set a color scheme are provided. A color blind or low vision person to access this Website, the color theme change or text size change may be required to help browse through the pages.For example, one can use this option to increase the size of the text for clear visibility and better readability. Headings:The Web page content is organized using appropriate headings and subheadings that provide a readable structure. H1 indicates the main heading, whereas H2 indicates a subheading. In addition, for the screen reader users, there are hidden headings in this Website that are read out by a screen reader for better readability. For example, the Navigation pane has been given a hidden heading as Global Navigation. Expandable and Collapsible Lists:Lists of items are provided that can be expanded to view a list of sub items or can be shrunk using a keyboard, mouse, or screen reader. There are many Web pages in this Website that contain expandable and collapsible lists. Each item in the list is preceded by the '+' symbol that indicates its expandable state.This symbol has been given alternate text to enable the screen readers to identify the state of the symbol to notify users with visual disability. When the '+' symbol is clicked, it changes to '-' that indicates its collapsible state. Further, the alternate text is updated to indicate the same and a list of sub items is displayed. If '-' symbol is clicked, it changes to '+'. Further, the alternate text is again updated and the list of sub items goes away, which is referred to as collapsing. A+: On clicking this icon page font size would increase to two levels. The % of increase can be customized through the Content Management System. A: Displays information in a standard font size, which is the default size. Applications/components/web services are published on the eGov AppStore through a Workflow. 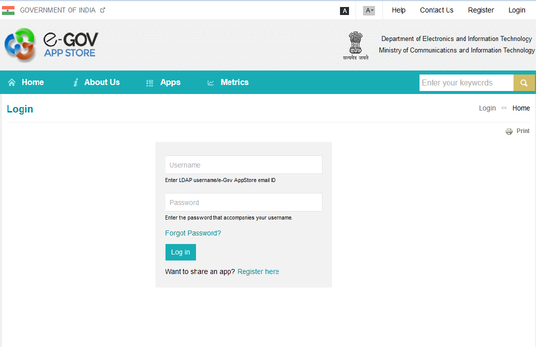 Contributor - Only registered users (contributors) can contribute applications/ components/ web services/ mobile app in eGov AppStore. Validator - The contributed applications/ components/ web services/ mobile app are further approved and forwarded by the Validators (registered users next in the hierarchy) to the Central Project Management Unit (PMU). PMU - In the final step PMU (Committee with members from NIC/ DietY) publishes the applications/ components/ web services/ mobile app on the eGov AppStore. 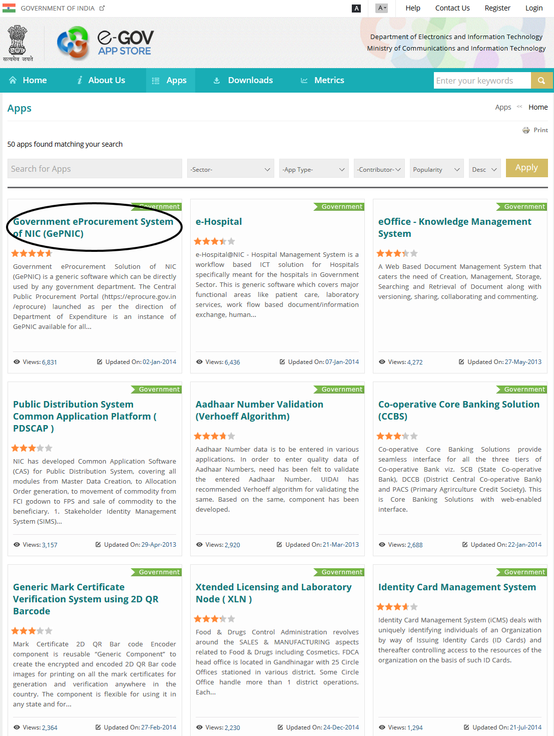 NIC may revoke your account, remove your applications/ components/ web services/ mobile app from the eGov AppStore, and delete ratings and reviews. Your account is only for your use, and you are responsible for all activity that takes place from your account. Contributor may submit to NIC, each application that he/ she wish to make available through eGov AppStore, including any updates to each application/ component/ web service/ mobile app, duly forwarded through the validator. NIC will preserve (or destroy) all copies of the application/ component and other materials you submit. It will not return them, so you must maintain your own backup copies. PMU will evaluate each application/ component/ web service/ mobile app (including any updates) you submit to determine whether it complies with this agreement (which includes the Certification Requirements) and policies made available to you (if any). NIC will not make any Application/ component/ web service/ mobile app available in the eGov AppStore unless and until it is certified by PMU. You are solely responsible for providing all content made available through your application/ component/ web service/ mobile app, including the name, trademarks, logos, icons, titles, product descriptions, documents, brochure, photos and screenshots that is provided to eGov AppStore. If NIC receives a claim from a third party requesting that your application be changed or removed, NIC may refer that claim to you. You must comply with the notice as soon as reasonably practicable, together with any other requirements. If you discover that your application/ component/ web service/ mobile app violates the terms of this agreement, you must immediately notify NIC and work with NIC to repair the application/ component/ web service/ mobile app. If you believe another application violates your rights, you may submit a claim to NIC. NIC has no obligation to make any application/ component/ web service/ mobile app available that you submit, even if that application/ component/ web service/ mobile app is certified. NIC will, in its sole discretion, make all decisions regarding placement or promotion of application/ component/ web service/ mobile app in the eGov AppStore. NIC may remove or suspend the availability of any application/ component/ web service/ mobile app from the eGov AppStore for any reason or no reason. NIC also may disable previously runnable application, if NIC believes that the application could cause harm to end users or any network, or to comply with any judicial process, government order or lawsuit settlement. The eGov AppStore is the property of NIC/ DeitY. NIC/ DeitY may change or discontinue the eGov AppStore at any time. Step 1:Registered/ authenticated user can contribute an application. Step 2:The contributed application will be processed/ validated by the approver/ validator. Step 3:eGov AppStore Project Management Unit (PMU) will publish the processed/ validated application. i. Register with eGov AppStore website. ii. An email will be received on registered email ID will a link to activate the account and generate password. iii. Provide credentials (username and password) to login. v.	On successful login, go to dashboard. Click on “Share an App”. vi. Fill the application details and submit the application. The application will go to appstore team for processing. If details found correct, application will be “Published” on AppStore website. After successful login, he will click on dashboard. Validator can approve and forward the application to PMU. PMU can publish the application on AppStore.